Deleuze and Guattari’s idea of the rhizome is based on its original definition as a form of plant and as they explain it is “absolutely different from roots and radicales” (1987: 6). It is “erratic, chaotic, [and] opportunistic” (Woods et al 2013: 4), it “spreads like a patch of oil” (Deleuze and Guattari 1987: 7) and is made up of “connections that occur between the most disparate and the most similar of objects, places and peoples” (Colman 2010: 232). They use the example of ants to help explain - “you can never get rid of ants because they form an animal rhizome that can rebound time and again after most of it has been destroyed” (Deleuze and Guattari 1987: 9) - hilariously relevant to my life because of my dad's never-ending battle with the ants at our house. A couple of years back I used the rhizome to help discuss the #occupy movement and what follows are some excerpts that I hope will be helpful in understanding this mysterious yet ever-present theoretical creature. Just quickly, the #occupy movement, inspired by the swell of international protests, most notably the Arab Spring, began in New York City. 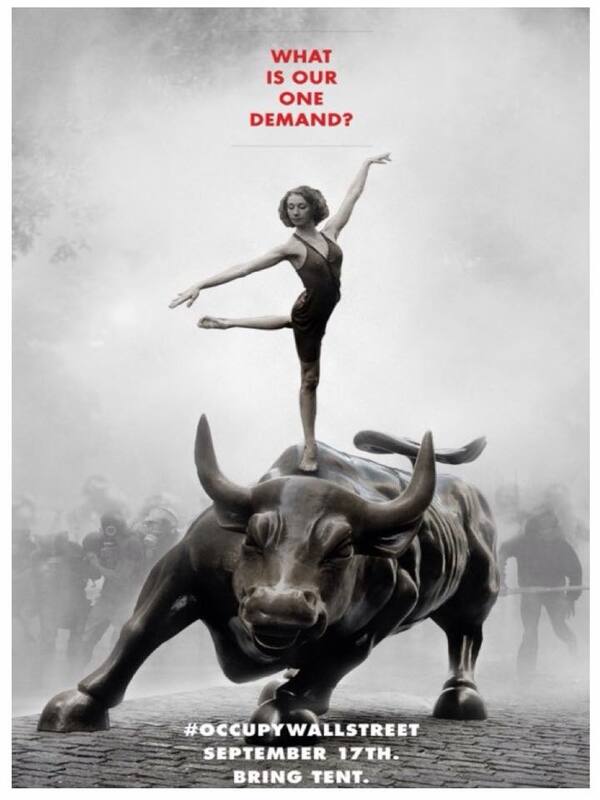 The initial call to action came from Adbusters, who published a blog post encouraging the “90,000 redeemers, rebels, and radicals” that subscribe to the magazine to, on September 17, “flood into lower Manhattan, set up tents, kitchens, peaceful barricades and occupy Wall Street for a few months” (2011). Around 2000 people answered that call and arrived in Zuccotti Park, which lies at the centre of New York’s financial district. In the following months the #occupy movement began to appear worldwide, culminating in over a thousand encampment locations, across every continent (Occupy Together N.d). Switching back to D & G (no, not Dolce and Gabbana), we're reminded that “any point of a rhizome can be connected to anything other, and must be” (1987: 7). They emphasise that a rhizome describes the networks between all objects – both different and similar to each other, “the strange chains of events that link people, the feeling of ‘six degrees of separation’” (Colman 2010: 232). It is “acentered, non-hierarchical, ... without a General" (Deleuze and Guattari 1987: 21). In terms political movements, “rhizomic political assemblages emerge without the formalities of leaders or constitutions” instead functioning as “swarms, with a collective thought process that is open to suggestion” (Woods et al. 2013: 3). This is pretty reminiscent of #occupy which the media regularly lambasted for being leader-less, demand-less and seemingly unorganized. When the first #occupy encampment appeared in Zuccotti Park, there were numerous attempts to ‘plot a point’ and ‘fix and order’, by those within and outside. Such attempts mostly failed. Instead #occupy encouraged an environment that was not dependant on “centralised decisions or formal resolutions”, which meant connections could be made by any point, to any other point, without passing through a centre or leader (Woods et al. 2013: 3). ‘Occupy Together’, an online platform fostered such connections. Through the development of it’s ‘#occupy directory’, the website coordinated activists who wanted to set up camps, according to their location (Donovan 2012). Joan Donovan (2012) proposes that it was platforms and sites such as ‘Occupy Together’ that allowed a “back-and-forth among activists”, bridging the divide between the virtual and material, whilst also allowing protestors to feel connected from “everywhere and anywhere” (Donovan 2012). This same decentralised character, which allowed multiple connections, also discouraged hierarchy by not allowing one centre (for example, one individual, group, location, or idea) to gain superiority. Anti-hierarchy was also demonstrated in the General Assembly (GA) - a “gathering of people committed to making decisions based upon collective agreement or consensus”. The jist of a GA is that “an individual shares what is being proposed, why it is being proposed, and, if there is enough agreement, how it can be carried out” (NYCGA N.d). Following this, the assembled group AKA the Assembly expresses their opinion of the proposal through a collection of hand gestures – hands raised upwards represent agreement; hands facing down represent disagreement; hands in a triangular shape signify you did not think the process of discussion was being followed; and arms crossed across the chest to form an ‘X’ signify outright opposition to the proposal and need for revision. If consensus can't be reached among those participating, the proposal had to be revised. However, if there is agreement then direct action begins. In essence the GA fosters a “horizontal, autonomous, leaderless, modified-consensus-based system” (Schneider 2011) which sounds pretty awesome, right?! So Deleuze and Guattari also say that a rhizome “may be broken [or] shattered at a given spot, but it will start up again on one of its old lines, or on new lines” (1987: 9). Likewise, Woods et al. explain that “rhizomic political action is not derailed by minor setbacks, [but instead] tactics are refined through trial and error … [and] the rhizome adapts. Through their capacity to switch forms, tactics and names, to gestate ‘underground’ and to sprout in unexpected places, rhizomic assemblages evade control and capture” (Woods et al. 2013: 4). #occupy began with blog posts, tweets, statuses and comments on digital platforms, and then spread to the physical world in the form of encampments, whist continuing to gain support online. Although there are no current encampments, their decentralised presence that crosses multiple online platforms and physical locations has meant that it has been difficult to stall or subdue #occupy fully. It cannot be destroyed by focusing criticism on a single person, encampment, or idea. Rather, because of the multiple connections across countless technologies and practices, struggle against particular appearances of #occupy are like trying to “keep the ocean’s tide back with a broom” (Haggerty and Ericson 2000: 609). One example is that of the many #occupy Facebook and Twitter accounts that were created in 2011 which are still active, including Occupy New Zealand and Occupy Wall Street. It's just like my dad always says 'When will these bloody ants die!' Probs never to be honest, Dad. *This is my attempt at creative writing. The rhizome is a one of many concepts in Deleuze and Guattari's 'toolbox' publication, A Thousand Plateaus, which was published in 1987. 2010. ‘Rhizome’. In The Deleuze Dictionary Revised Edition. Adrian Parr, ed. Pp. 232-235. Edinburgh University Press: Edinburgh. Deleuze, Gilles and Felix Guattari. 1987. A Thousand Plateaus; Capitalism and Schizophrenia. Translated by Brian Massumi, University of Minnesota Press: Minneapolis and London. 2012. ‘How Occupy birthed a rhizome’. Waging Nonviolence, September 17. Accessed online at http://wagingnonviolence.org/feature/how-occupy-birthed-a-rhizome/ on 11.10.2013. Haggerty, Kevin and Richard Ericson. 2000. ‘The Surveillant Assemblage’. In British Journal of Sociology, Vol. 51, no.4, pp. 605-622. N.d. ‘NYC General Assembly’. Pamphlet produced by #Occupy Wall Street; New York. N.d. Accessed online at http://www.occupytogether.org/ on 20.10.2013. 2011. ‘Occupy Wall Street: FAQ’. The Nation, September 29. Accessed online at www.thenation.com/article/163719/occup-wall-street-faq# on 10.10.2013. Woods, Michael, Jon Anderson, Steven Guilbert and Suzie Watkin. 2013. ‘Rhizomic radicalism and arborescent advocacy: a Deleuzo-Guattarian reading of rural protest’. In Environment and Planning D: Society and Space, 31, 1-17. Awesome article, I really like your writing style, Hollie, and the fact that you just lost the game.